What is that noise?? Ting . . . Ting . . . Ting! Is something bouncing off the headers? Ting . . . Ting . . . Ting! Do you hear that? Is it the inner fenderwell? What could it be? This was how my trip to the Goodguys 13th Nashville Nationals went. “Tinging” all the way around town! When you’ve owned a car for 32 years, you tend to know every little noise it makes and this one wasn’t one of the “normal” ones. It was a faint noise, barely heard over the blower whine and exhaust note of my ‘55 Chevy. Evidently, I was the only one who could hear it, until I popped the hood for a closer look. That’s when I noticed the water pump pulley wobbling ever-so-slightly. The pulley was just barely scraping the housing of the water pump, making that tinging noise like one of those toy monkeys with cymbals. I turned the key off and grabbed the pulley to find it was still intact, but sketchy at best. As I suspected, the old cast-iron water pump was on its last legs — not dead yet, but one foot in the grave — the shaft had indeed separated from the impeller and bearing. It was working, but not as well as it should, so I kept an eye on the temperature gauge the rest of the weekend. Time for a new water pump, but who should I turn to? The answer was easy: Tuff Stuff Performance Accessories. My old swap-meet water pump gave up the ghost at Goodguys Nashville. The impeller was still intact, but just barely. The bearing had given way making the shaft wobble within the case and causing the pulley to nick the outer housing. Time to call the pros at Tuff Stuff. I’ve seen Tuff Stuff gear at quite a few car shows over the years and really like the look of its products, but have never had a need for what the company offers. I looked at its water pumps the past couple of years to replace my wobbly one, but at the time it was just a “want” part instead of a need — if it ain’t broke, don’t fix it, right? Well, the time had finally come, so I hit the Tuff Stuff website. Time was of the essence as the Street Machine Nationals was just around the corner. Everything I have in the engine bay of the ‘55 is billet, polished aluminum, or painted black, so I was on the lookout for something that would match. At one of the car shows, I spied this awesome looking polished-aluminum water pump in Tuff Stuff’s booth. Seeing as how I don’t run a heater on the car, what I liked is that it didn’t have the top threaded water port. It is a smooth, polished-aluminum pump — and looks fantastic! Much better than the old chrome water pump I had that didn’t match anything under the hood. When I hit the Tuff Stuff website, I found out I needed more information than I thought I did! My understanding was there were two different water pumps for a small-block Chevy: long and short. I quickly found out there are three and you can also get them in reverse flow. I would need to measure the height (or depth from the block) and pilot shaft to make sure I ordered the right one. A quick trip to the garage revealed I would need a 5.625-inch hub height with a ⅝-inch pilot shaft. The other thing that might confuse someone (in a good way) when selecting a water pump on Tuff Stuff’s site, is all the options they have available. You can get any pump in a variety of colors or finishes, with or without the top threaded port, or in standard or reverse direction, leaving you with 53 different options. Tuff Stuff’s website has details on all the different water pumps it offers. Pay close attention to the hub height, pilot size, and direction when choosing. Paying close attention to the height, pilot size, and finish I wanted, I narrowed down the search to part #1353NB — the Platinum Supercool Water Pump with 5.625-inch hub height, ⅝-inch pilot, short flat smooth top and no top-threaded water port. This height was very important to me, as I have very little clearance between the water pump pulley and the electric fan motor attached to the radiator. Talk about close! 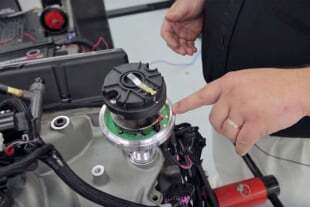 There is maybe an 1/8-inch clearance between the water pump pulley and the electric fan motor. The blower belt surrounds it all. It’s tight to say the least. Instead of just ordering the part from Tuff Stuff’s dealer network, then doing a boring install article — which let’s face it, would show me installing 4 bolts — I decided to get a little more information for others out there considering (or needing) a water pump change, so I called up Mike Stasko and Matt Oliver at Tuff Stuff to get the details on its water pumps. First off, when the box arrived on my doorstep, I noticed Tuff Stuff’s motto is “Our Chrome Will Get You Home.” Catchy, but what does it mean? 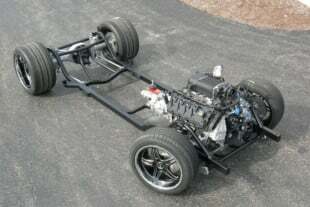 Mike: Our only business is manufacturing high-performance, custom-finished components for hot rods and customs. Tuff Stuff was the first company to come out with a one-wire alternator many years ago and there were people saying that chrome-plated alternators would overheat. Obviously, we now have 25 years of history which shows that is not the case. At the time, we knew we needed a tagline to show our alternators and starters were dependable. PAM: I ordered the Supercool polished-aluminum water pump. Obviously, I liked the look, but there’s a lot more to it. What are some of the features that set this pump apart from others on the market? Matt: The Supercool impeller is a proprietary design that increases the flow of our water pumps from 37 gallons per minute to 56 gallons per minute. 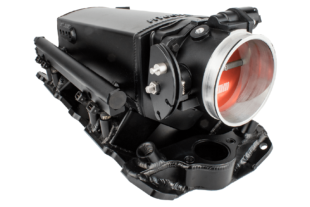 This creates 30-percent more coolant flow to reduce water temperature by up to 20 degrees, keeping the engine cool under all driving conditions. Our awesome chrome and powder coating is also done here in house in Cleveland, Ohio. In full disclosure, I ordered the pump having no idea what type of pump was on my car originally, so I went for the high-flow pump, thinking “high flow” must be better, but it didn’t perform as well as the old one before it gave up the ghost. This prompted my call to the Tuff Stuff tech line and we figured out I needed a high-flow thermostat (Part #900180) as well, and now it works perfectly. I think this is something some people may not know about. Can you explain what this is and why it is necessary? Matt: Standard thermostats flow about 37 gallons of coolant per minute. With Tuff Stuff’s High-Flow thermostat, that number jumps to 56 gallons per minute. That’s almost a 50-percent increase in coolant flow. 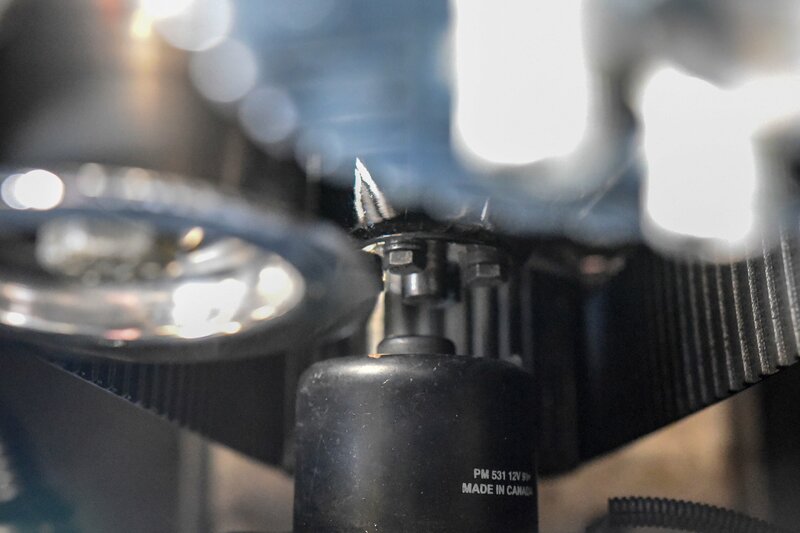 The increased coolant flow will reduce the delay in engine warm-up times, allows trapped air in the cooling system to escape and stabilizes the pressure of the cooling system overall. Tuff Stuff’s High-Flow thermostats also have a bypass valve that allows a small amount of coolant to circulate before fully opening. When purchasing a high-flow water pump, you should also get a high-flow thermostat. Matt Oliver suggested I replace my original thermostat with a 180-degree SuperCool High-Flow Thermostat (part# 900180). Lastly, Tuff Stuff makes a lot more accessories than just water pumps. Can you tell our readers some of the parts you are known for, and maybe a few things you have on the horizon for them to look forward to? Matt: As Mike said, we are probably best known for being the originator of the one-wire alternator. Enthusiasts prefer that clean, simple look and the low idle cut-in internal regulator that provides plenty of charging at low RPM. We are a 40-year family-owned company that hand-builds our parts in Cleveland, Ohio, using 100-percent new components, carrying a one-year limited warranty, and are tested to meet or exceed OEM specifications. 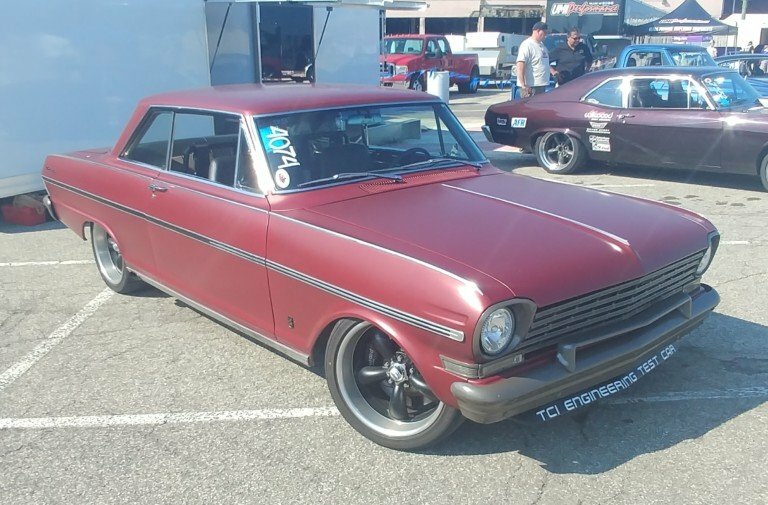 We have something for virtually all muscle cars, hot rods, customs, and light trucks in just about every finish imaginable. Speaking of trucks, we’re going be unveiling an exclusive line of off-road high-performance accessories at the 2018 SEMA show that is not like anything else out on the market. At last year’s SEMA Show, trucks were certainly the hot ticket so it looks like Tuff Stuff remains at the forefront of what is happening in the industry. Installing the water pump and thermostat was easy, but a little more time consuming with a big blower, and its belt, in the way (getting photos in that confined space was next to impossible). The thermostat housing sits directly below the supercharger and I have a stainless steel hose coming from the radiator, so it was difficult to replace without getting gasket sealer all over the place. I took my time and got everything lined up before torquing down the three bolts holding it in place and reinstalling the hose. I had to stand on my head to install the new 180-degree SuperCool High-Flow Thermostat, as the housing sits directly under the supercharger. Luckily, I got it right the first time! The water pump was slightly easier to install. Once I drained the radiator below the level of the pump, I removed the bottom hose and removed the four bolts holding it to the block. The new pump came with two new gaskets, so I just made sure to coat them well with Permatex gasket maker and reinstalled the bolts just finger tight. After an hour, I went back and torqued them to spec and reinstalled the bottom hose. Lastly, it was time to put in some fresh coolant and fire it up. It used to be a task to get the air out of the system. The temp would skyrocket before the thermostat would open. I would have to try several methods to get the system to burp and ingest the coolant sitting behind the thermostat, but Tuff Stuff’s bypass valve allows the water to flow and air to escape – it’s ingenious! The water pump install is simple, but it’s a tight fit. 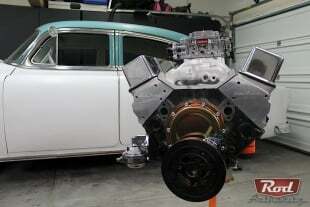 Note, I have a spacer between the block and water pump to clear the billet timing-chain cover. Luckily, they didn’t come off with the old pump, so I didn’t have to re-gasket them. Now that I’ve had the pump on for a few months, I have noticed that it really is much more efficient, even during these hot summer days. I have my electric fan hooked up to a manual switch under the dash and I used to have to make sure that the fan was running in low-speed conditions, especially in traffic, where I would always keep one eye on the temperature gauge. Since I’ve switched to the Tuff Stuff pump, I rarely need to use the electric fan if there is any air moving across the radiator at all — something that is virtually unheard of for a blower motor. The new Tuff Stuff SuperCool Water Pump looks right at home on my engine. I’m very pleased with its ability to keep the car cool under low-speed conditions. 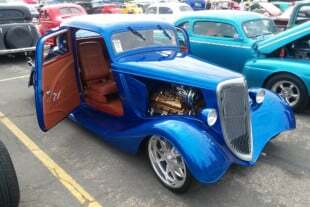 I attend several car shows that allow cruising on the grounds, such as the late-June Street Machine Nationals in Du Quoin, Illinois. Three years ago, the ‘55 was carbureted and I could only make it about halfway around the grounds before I needed to pull over and let the car cool. Last year, after changing to EFI, I was able to make a lap (which can take an hour) and when I returned to my spot the temperature was 194-degrees — not too shabby. This year it was much hotter with a heat index of 106-degrees and I made it a point to test out the new water pump in the heat of the day. It took me 2 hours to get all the way around the fairgrounds. I never shut the car off and the temperature never went above 184-degrees. I will take that any day! I love the way the Tuff Stuff pump looks and performs. If any of you out there in internet-land are looking for a water pump (or really any accessory), I highly recommend checking out Tuff Stuff’s website or giving them a call. There is just something extra special about an American company making parts specifically for our hobby that gives you that extra little confidence that, indeed, their chrome will get you home!